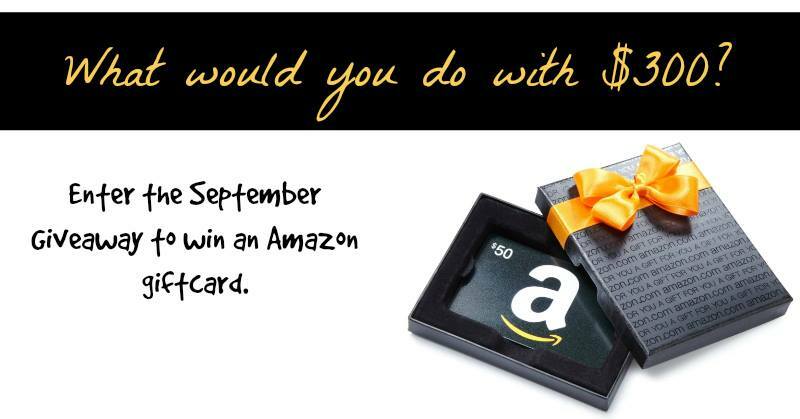 Amazon Gift Card Giveaway–What Would You Do With $300? Well, I pretty much took the summer off from blogging on my personal website. Sometimes life is just like that, you know? I had a great summer with my girls and got a lot accomplished. Now, I’m back and working on some new projects for a proposal my agent and I recently submitted to my editor—I’ll let you know as soon as we hear something! I’m trying to get back to blogging more on my site about the things I love–books, writing, real food, healthy living, and essential oils—and I figured the best way to kick off my return from summer hiatus was with a giveaway! When I’m not writing, I have an interest in real food and natural living. And just like I have author blogging friends (like the fine ladies here on Inspy Romance) I also am friends with some rockstars in the natural living/real food blogsphere. And for September, I’ve paired up with some of my favorite blogging friends to do a $300 Amazon gift card giveaway! And I thought I’d be crazy if I didn’t share it with you all too, because you can do a lot of reading with $300! As with other Amazon giveaways I’ve done with this group of friends, you can use this giveaway for anything your heart desires on Amazon…but if your shelf is missing one of my books, this giveaway is going to be perfect for getting your copy of Saving Gracie, New Year’s Eve, The Cupid Caper (Or all three. I’m not going to stop you!) See? I told you this was going to be fun! 1. Click here to check out what you could win! (Come back and after reading to finish steps 2 & 3). 2. Join My Newsletter List where I’ll be talking about the best of food, family, and fiction. 4. Use this Rafflecopter giveaway link to enter! For more ways to win, be sure to visit my webpage for a list of all of my other blogger friends who are teaming with me to offer this awesome giveaway! You can register on each of their pages as well. A winner will be chosen via random.org. We will announce the lucky winner will be announced by October 1, 2014. I’ll post the winner’s name on my Facebook page and on the original post on my website. The winner will have 48 hours to respond to an email with his/her full name, address, and phone number. There is no purchase necessary to win. This giveaway is open to everyone! I'm an author of inspirational and sweet contemporary romance stories of love, laughter and happily ever after and the Mama behind the Real Time Mama blog at www.kristenethridge.com, where I talk about food, family, faith, and fiction. My first book, Saving Gracie, came out from Love Inspired in February 2013 and I'm represented by Elaine Spencer at The Knight Agency. A devoted Baylor Bear, I live in North Texas with my husband, two redheads, and a self-important poodle. I love interacting with readers, so join me on my blog, on my Facebook author page, on Pinterest, and on Twitter. Hi Kristen, thanks so much for the opportunity to enter your $300 Amazon giveaway! And you can bet IF I am fortunate enough to win, I definitely would spend some of it on ” Saving Gracie, New Year’s Eve, The Cupid Caper” and a fancy new KINDLE to read them on! then I would not have to read them on my BIG pc with the Amazon Kindle app!!! Some other books would be some of your healthy recipe books, etc!!! I would you use it to buy a phone…and also a book or two! I would use the card to buy books of course! I would definitely check out yours. I’d probably go Christmas shopping on Amazon for my granddaughters! But hmm, I do believe I’m missing one of your books, Kristen… I might have to remedy that! Ok have a growing wish list on Amazon of books and things I want to get my kids for Christmas. i would buy the LG Electronics 32LB5600 32-Inch 1080p 60Hz LED TV. it would be a x-mas gift for my daughter. I would get a kindle, I think. Then stock up on art books! Thank you so much for this giveaway. I think I have all of your books, but of course, if not, I will resolve that oversight. LOL I have such a long list of Amazon books to get, including several by other authors in this group, so, my tablet would instantly be full. I would buy a huge stash of Inspy Romance writers books… And use the rest for Christmas presents. the new kindle for kids with the two year warranty! looks like a great buy! Lots of great books!!! And of course they’d be by great authors like the ones I read about here!! I would love to have a nice camera, so I would put it towards one.